With the football (soccer) Premiership kicking off this weekend in the UK what better way than to keep tabs on the results than with your BlackBerry. Us British folk are football mad (although I can't see the attraction!) and for millions of fans both at home and abroad the football scores are paramount once the season begins. The Sky Sports Live Football Score Centre is the perfect way to keep up to date with how your team is doing. 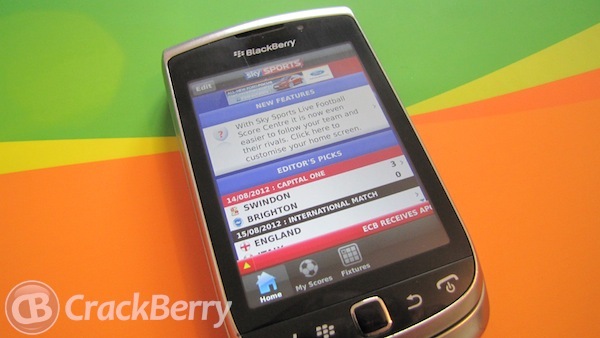 Free to download in BlackBerry App World it will provide you will extensive coverage of every football match in England and Scotland, Europe's top leagues as well as European Cups and international fixtures. If only certain matches are of interest then fear not - The 'My Scores' feature will allow you to follow specific matches and in addition you can personalise your your home screen to flag up important information. With built in notifications you will be kept up to date will all the important goings on straight to your BlackBerry inbox. Does it get any better than that?